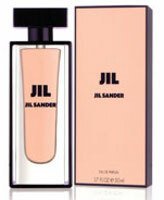 Jil Sander will launch Jil, an "elegant floral amber" fragrance for women, in September. Jil was developed by perfumers Olivier Polge and Bruno Jovanovic; the notes feature pink pepper, lavender, mandarin, lily of the valley, iris, heliotrope, musk, vanilla and amber. The packaging looks like 2 designers fought it out and neither won – the large, rounded font on JIL seems totally out of place on the Narciso-ish bottle. I’m all for a good amber, but the pink pepper and lavender notes makes me wonder if this is going to smell disjointed (like the bottle). It is not sounding like something I’d love. But doesn’t matter, I never see JS fragrances anywhere. Parfumelle website carries seven of the Jil Sander fragrances. They are really nice people and have nice perks on shipping and also discounts during your birthday month. They have a lot of hard to find and old fragrances. I found Bakir there when I looked all over the place. Also the old Secret of Venus which now smells nothing like it did when I was a kid unfortunately. Thanks, but doesn’t much help me since what I need is to find a few testers! Neiman Marcus does carry a few of the line, but not many. I know Saks has a few as well but I never go to Saks so it doesn’t help. The primary forms of the bottle work with the font, which is Futura in the extra black style. I closely associate both the bottle design and the font with the Bauhaus. Is she trying to get into that sweater or out of it??? If you don’t make your model look double-jointed then it’s not “real” fashion photography. I thought it wasn’t real perfume photography if she wasn’t mostly naked or looking really MOOOODY! Ripped bodices as far as the eye can see? Funny–I looked at that and thought it looked like someone caught in mid-motion doing the “Elaine Dance” from Seinfeld. I’d like to try a good amber, too. I really like the idea of amber, but they invariably seem so sweet I’m never tempted to buy one. I’m not a huge amber fan myself…do like a few that are probably more about vanilla than amber. Don’t they already have a Jil? Unless that fragrance is “Jil by Jil Sander” this is really confusing to the 7 people who buy these fragrances. Not that I do. Just sayin. isn’t this the 3RD Fragrance Named simply, “Jil” that Jil Sander has produced? what is with this company? they reuse and recylce fragrance names like some kind of brain dead marketing exec! The Bottle is BEAUTIFUL, Yes, The Fragrance sounds WONDERFUL!, Yes, but as Robin said… it verges on the impossible to Find these Fragrances in any store anywhere! I mean, It’s a Polge doing the Fragrance, it can’t POSSIBLY be awful! But i fear i will never get a whiff of it because of the bad decisions of the house! Oh Bother! It might be the 3rd, it’s certainly at least the 2nd. They all do it though! Okay, I was already nearly happy they brought my beloved JIL again (the one in a white satin bottle, smelled sweet (white chocolat?!) and I loevd it until it was discontinued. Looks like Narciso Rodriguez. It aims at the same customers I guess. Will try it because of Polge, and JS makes good scents after all. Massmarket, but good. it sounds ok but nothing I feel like trying. That takes care of that then. The bottle looks like the bottle of Narciso Rodriguez for her, but the smells are completely different. Jil is nice and sweet, I don’t get the amber on my skin. Lasting power is OK. I personally like Jil Style more. Have smelt this only on microencapsulated fragrance strips in magazines here – how sweet!